Hello ! I am Dark Linkaël, webmaster of a Zelda website "Triforce Legend". Before to make a much detailed presentation about me and my project, I want to specify that I don't speak english and it's a member of my staff on Triforce Legend who translate for me. However, I can translate with Google Translate to go more fast and for shorts texts. Go ahead to my presentation now ! Zelda and me, it's a passion which lasted since end 1993 with the discovery of A Link to the Past (My favorite Zelda for ever). My occupations are often to do fan fictions ou again fan arts about Zelda universe. I hack video games too, and my most beautiful discovery is to have activated the Debug Map Select of The Wind Waker in 2011. 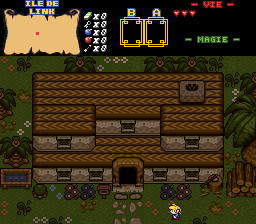 In Avril 2002, I had internet after learned Zelda Classic's existence with my cousin. For my childhood, it was my dream to create my own Zelda, but the times did not allow it ! I do often drawings about games. Zelda Classic has allowed me to create my own Zelda website, to improve me enormously in writing with my first fan fiction (May 2002) and to improve in drawing (March 2003). But to had created the character Kasuto (the character on my avatar), a young girl coming from one of my Zelda fan fictions. Anyway, I owe everything to Zelda Classic ! 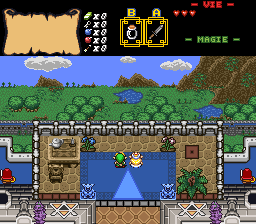 Just before to talk about my project, I realized a Zelda TLOZ NES-like between 2002 and 2011. Because I have a lot of occupations around, I take long time to finish this game. I will show it later, one time the lasts bugs corrected. Now, follow to my project ! 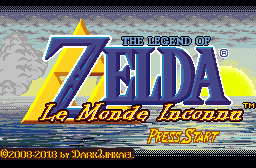 In September 2008, I started the challenge to create a Zelda to use the model "Dance of Remembrance" and have to title "Le Monde Inconnu" (The Unknown World in english). 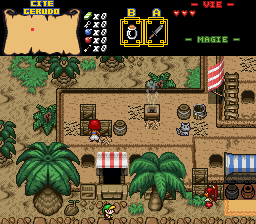 There are a lot of points to reach, the game is separate in three parts (it is not sure) and it is an open world on TLOZ NES's style, a freedom Hyrule and do dungeons on the order. 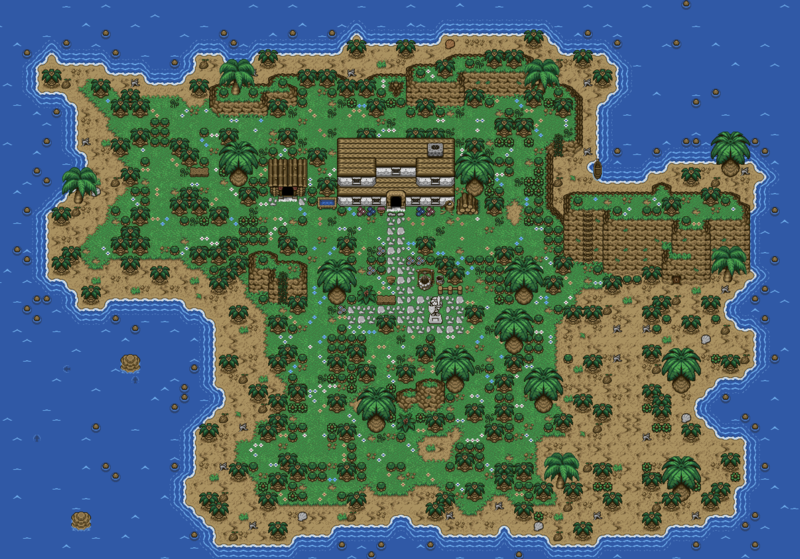 The beginning take place in Link's Island, an island gifted by the Hyrule King after a former Link's quest. 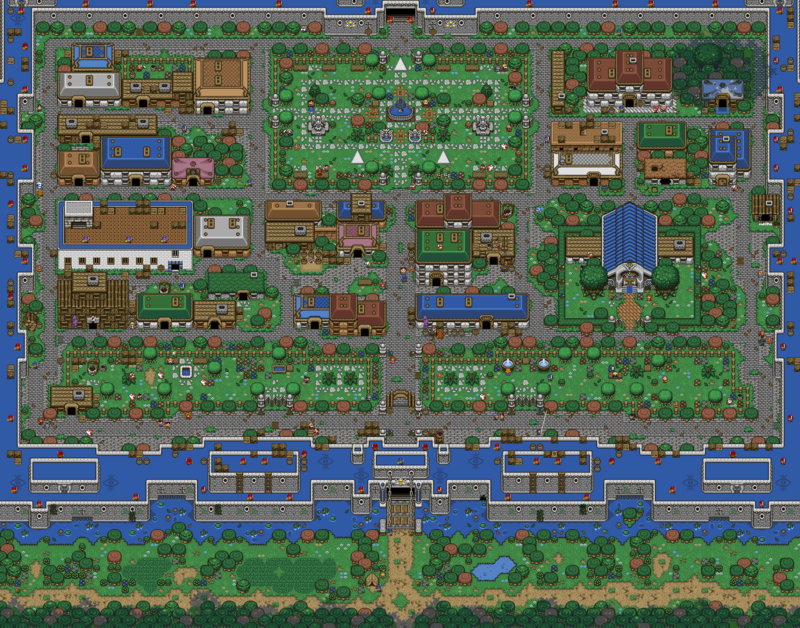 In this beautiful Island, he live with the young Kasuto who become a hero for Hyrule too. This last one go to be kidnapp by stranges soldiers. Link go to research her obviously, but his quest going to be extremely long and will lead him to differents problems which he will fix on Hyrule kingdom. Game style, ann open world like TLOZ NES and BOTW. 23 maps (Overworld type, and it is possible to visit them (or close) after finished the first dungeon). 9 dungeons (All of them with a different theme : Forest, Mountain, Lake, Snow, Swamp, Desert, Graveyard et Sky). 13 cities/villages concealed among the 23 maps. Exploration has a major role in this game, as is BOTW. But to make a perfect balance, the dungeons remain in order. Just the beginning of the game with the first dungeon that is linear, a case seen in OOT and TP for example. Possibility to play an another character than Link at some moments on the game. An hommage to TLOZ NES, there are secrets passages (less or more difficult) to discovery on the 128 squares (or not) on the 23 maps. One hundred of houses (Bigs or littles). One hundred of caverns (Bigs or littles). A lot of places like temples, palaces, ruins, fortress, sewers, mines, etc. A place with 50 floors (Like on The Wind Waker and Twilight Princess). 30 hearts (8 gived automaticly by dungeons's bosses). 5 Pieces of Heart as in TP (95 total for 19 hearts). Several mini-quests with more or less important rewards. Exchange items that may be obligatory. Some villages could be take place during the night too. 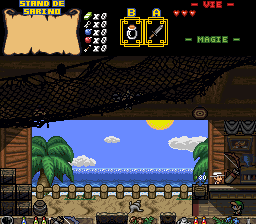 Mini-games like shooting stand with the bow by example. A long secondary quest to eliminate bandits living on camps. 200 Gold Skulltulas are hidden in the game. A lot of scenes, some of them with pictures. Ameliorated backgrounds and ambiances soundtracks on somme places. Musics from Zelda and from others video games (Nintendo, Sega or PC). Release date : Not very a long long time, the game is so long when I can do many years. If it's close to 9 years when I work on this game, it's because I had longs moments of pause and still my occupations as I said before. However since Avril 2017, I practically did 50 times more in relation to the 2011 - 2017 period. I am very inspired, I try to keep this inspiration to moving forward the most possible in the game. The fact to do a map (represented by the 23 squares and the list of each place of each of them), 2 months ago it give me a good idea about the Hyrule kingdom that I want to realise. Before, I did not know too well in which direction I was going and so the project dragged a lot. A last little precision, I am not a great specialist in script, I do my best in this domain and use only scripts proposed on the website PureZC. Fewer maps planned at the time, 18 or 19 in total. Lots less ideas about places too. Edited by Dark Linkael, 30 March 2019 - 05:51 AM. Welcome! And wow, that looks really good so far. I love the lava cave, and I really like the screenshots with the views. I've never really seen ones so detailed before. Keep up the good work! This quest is looking pretty cool. Your screens have a level of detail that you don't see too often these days. Looking forward to playing the final product. 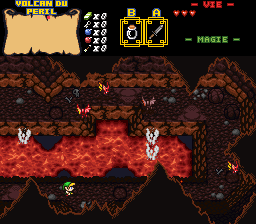 As Anthus said, the lava cave area looks fantastic. I'm also really liking the bottom rightmost screen of the extra screenshots. Really cool stuff. Wow! This project seems really great. I wish you best of luck. Thank you very much for your comments ! It's very motivating! I do my best to finish this very very long quest and especially to propose a demo. Wow, we have a worthy successor of Lost Isle ... out of words, just wow! Please don't stop working on this, it's fantastic! It's too much honor, so much I know it's a great quest! I just added a few more details on the first post, including the progress of the 23 maps of Hyrule Kingdom (outside only). I tried to do a comparison of Hyrule’s map between the 2008 to 2017 period and the last 4 months (when I resumed the game in April 2017). Yes, because I keep old copies of the progress of my game to see the progress. I practically did as many cases in 4 months (312 cases) as in the period 2008 to 2017 (332 cases)! Proof that I am well launched since I have a clear idea about the game. Not counting many interiors and scenes that I realized since April. Today, I think I'll finish a map, a map that was not very easy to make. A map that was not the most motivating to make, but it's the past now. This will be the fourth full map. Another map is already pretty full and I could finish in the next month unless I take care of other places in the meantime. Getting a very nice old school DoR feel from these. Great job. Wow, I must say this looks really awesome! These screenshots and maps you have so far are looking really well made. I'm definitely looking forward to checking this one out whenever it gets finished in the future. But wow, that is a lot of Z1 overworld maps you have there. It's gonna be quite a challenge to make sure all the maps aren't too empty or lacking with things to do. But hey, best of luck anyways! I love this style of DoR, it's my favorite. Very nice and fairly easy to use. It is often the risk with very large maps to have places quite empty. Many have thought the same thing with Breath of the Wild. But 2D and 3D are quite different. For my game, I try precisely that it is not empty or the least possible. 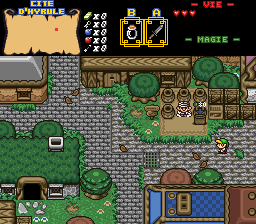 For example, adding secret passages (homage to TLOZ NES, which I found very amusing and which I had loved) can make it possible to fill this empty. About these secret passages, it can be very varied. Useful, very useful, compulsory or not very useful, or even leading to traps! There are also the famous caves with the old mans of TLOZ NES. In short, it is the surprise when discovering a secret passage! The challenge is immense, but it does not scare me. I would go to the end of this project, even if it takes years. I'm pretty free in my life. Finally, I rushed the release of the first official demo of my quest! You can download it on the first post of this topic. As a reminder, the demo goes to the end of the first dungeon. It is a game that is not very easy, but I try to calibrate the difficulty so as not to make the game too frustrating (At the beginning of the development, it was very difficult). It is entirely in French (I have not yet really correct the possible faults). Besides, I would also like an English version of my quest, but the work far too long. However, I can accept someone's help to ensure the translation of the game. Soon, I would publish a video of the beginning of the game as I had announced. However, I can accept someone's help to ensure the translation of the game. I'll be trying this out later for sure. So how much text is there? I'm not fluent in French at all, but I'd be willing to help translate stuff with Google translate or help go over stuff you translated to make it sound better since G translate isn't always 100% accurate. It's usually pretty good for French and Spanish though. For the number of texts, I do not know at all. I have reserved no less than 5000 strings to allow me to classify the texts by maps (23). But it will really contain a lot, I make practically speaking all the NPC. So it's extremely complex work. That's why I do not know how to do it. Some members of my website are currently testing the game to see if there are possible bugs or others. Some stuff might get lost over google translate. I don't think that's a good idea.